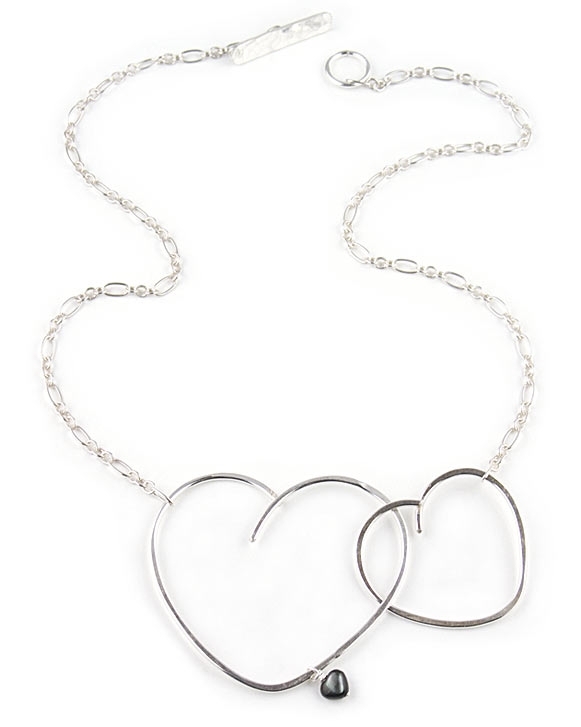 Silver heart necklace with mother of pearl by Parisian designer, Eloise Fiorentino. This beautiful designer necklace features two intertwined silver hearts with a dangling black/silver mother of pearl heart charm. Large heart measures 5.4cm x 4.7cm (2.1"x1.8") and smaller 3.2cm x 3.6cm (1.2"x1.4"). Necklace measures 49cm / 19.3 " in length. A funky designer necklace available exclusively in the UK from the Farfallina Online Jewellery Boutique. Length: 49cm / 19.3 "